Easts need a bigger Trophy Cabinet !!! 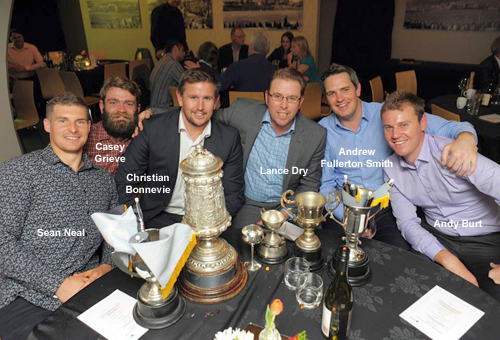 Congrats to all the winners at last night’s Cricket Wellington awards. The MIGHTY EASTS scooped a number of awards including numerous grade championships (including Pearce Cup! ), Best Captain (Lance Dry), most cumulative points as a club, Best average points as a club (we have 25 teams) and Best performance by a lower grade player for Dustin Viggars amazing six wickets in six balls! Lets come back and do it all again next season! 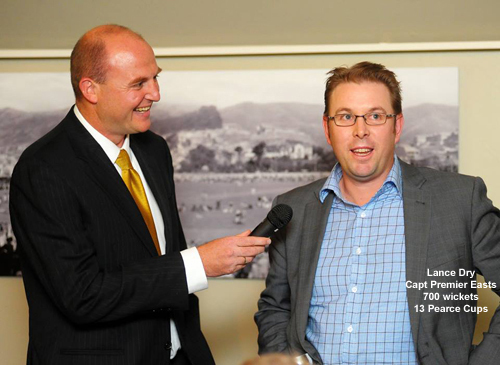 Cricket Wgtn Trophy & bat - Best Lower Grade Performance - Dustin Viggars (Easts Cobras) 6 wickets in consecutive balls. 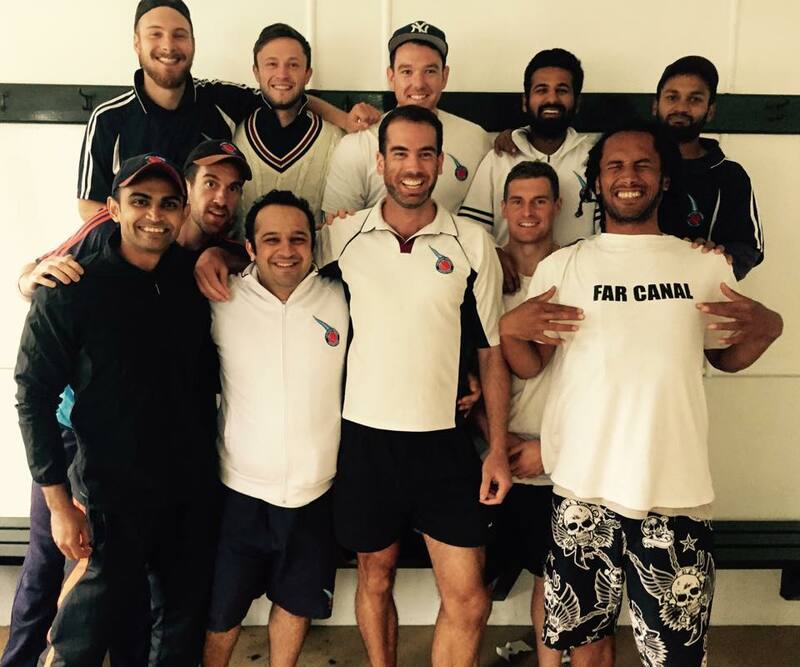 El Cheapo Cars Eastern Suburbs dominance of Wellington Premier Men cricket continues for another year. Easts were required to beat Taita outright in the Rothbury Wilkinson 2015 Pearce Cup Final to retain the trophy and have done so. Easts have now won the Pearce Cup for 13 out of the last 14 seasons. Congratulations to Lance and his team - a perfect end to another season. Standout performances from Jamie Gibson 4-32 & 117, Ili Tugaga 5-103 and Lauchie Johns 39 & 58 vital runs in our 2nd Innings. THE MIGHTY EASTS HAVE DONE IT AGAIN !!! 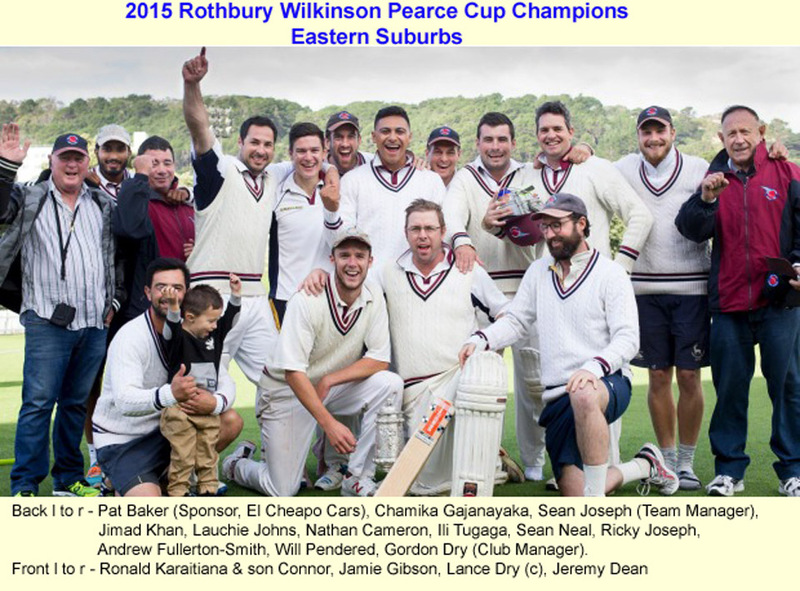 Once again the Easts Premier Men team have qualified for the 3 day "Rothbury Wilkinson PEARCE CUP FINAL" to be played at the Basin Reserve on Friday 3rd April to Sunday 5th April 2015. Taita ended up the leaders in the 2 day Pearce Cup competition and therefore it is a MUST for EASTS to WIN to retain the trophy for another year. Let’s get down to the Basin and support the Premier team. History shows that we can achieve this so "GO THE MIGHTY EASTS !!!!!" Easts Premier Reserve - "Class of 2015"
"Best club, team and group of mates I have ever had the privilege of playing the great game with. Let’s finish the season off in style tonight lads - with Samuel Shukla, Will Pendered, Nathan Cameron, Haseeb Quazi, Brad Coleman, Jamie O’Donnell, Sean Neal, Ankur Bassi, Far-Canal Blackdogg, Josh Allan, Oliver Fredrickson and Ani Chitre"
The MIGHTY EASTS have done it again !!!! Raffle result - Winner of the Black Caps World Cup Hoodie and Polo Shirt (donated by Jeetan Patel) Ticket No. 66 - Umesh Govind (Easts 4th Grade Bullets)!!! EASTS ROOSTERS, TIGERS, ACES & SMOKING PINEAPPLES have qualified for the One Day Finals in the lower grades. Go The MIGHTY EASTS !!!!!!!!!! Easts Roosters won by 5 wickets - Congratulations ROOSTERS !!!!!. Easts Tigers won by 61 runs - Congratulations TIGERS !!!!!. The Club’s end of season Prizegiving Dinner will be held on Saturday 28th March at the Clubrooms. The magnificent buffet dinner will be served at 8.30pm. Usual cheap bar prices. $20 per head no exceptions. A mystery guest has been arranged!! I want all teams represented!! There is no cricket for Premiers or Premier Reserves on the weekend of Saturday 28th Feb/Sunday 1st March. All other grades will play on the Saturday. The reason is, there are two World Cup teams in town (England/Sri Lanka) for the game at the stadium on the Sunday. On the Saturday both teams will be having net practices, and a lot of Premier club bowlers will be invited to attend as net bowlers for the teams. This couldn’t be done if those bowlers were involved in Club cricket. Premier Men - Jamie Gibson - 201 Not Out !!!! 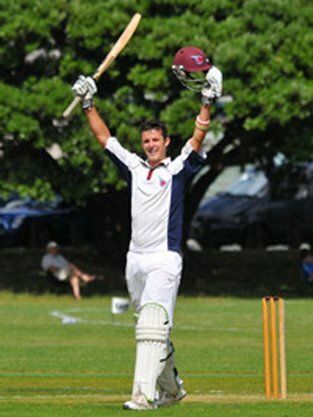 The highlight of club cricket on Saturday was undoubtedly Jamie Gibson’s outstanding unbeaten double century in Pearce Cup against the hapless Karori (despite the local morning rag thinking some nondescript club’s win in the second rate grade was more important). Jamie’s innings included 18 fours and 5 sixes and he brought up his 201 n.o. with a superbly struck six over mid wicket. It was an innings of rare maturity for the 21 year old, who mixed splendid shot making with concentration and patience. One of the finest innings seen in Pearce Cup cricket for many a year. In addition, a club record 8th wicket partnership of 160 was set with Lance Dry (78). 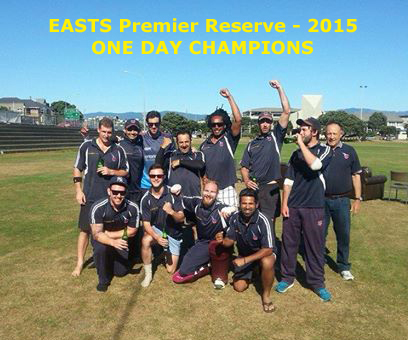 Premier Reserve - 2015 ONE DAY CHAMPIONS !!! 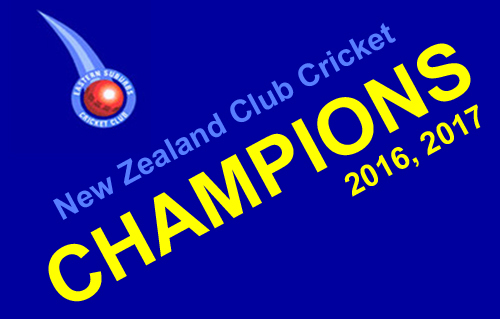 Congratulations to the Premier Reserve team who beat Karori comprehensively to be the one day champions for 2014/15 season. Easts won the toss and elected to bowl first. Karori wickets started to tumble as Nathan Cameron, Sam Outtrim, Vena Niutao and Will Pendered each bagged two wickets and Brad Coleman also getting one. Karori were all out for 195. Sean Neal was magnificent in making an unbeaten century - 114 not out along with help from Will Pendered who made 37 not out. Their parthership totalled 130 and Easts got home with 7 wickets to spare 196-3. Jamie Gibson has been named in the Wellington Firebirds side to play Central Districts at the Basin Reserve on 20th January 2015. Jamie scored 42 runs and managed to pick up 1 wicket for 23 runs. The young guns got the Firebirds home for a win. Jamie Gibson has been named dor the Wellington Provincial A side to play in the National tournament at Lincoln from 2nd - 9th January 2015. The tournament consists of 5 one-day matches against all the other associations and 3 T/20 matches against Auckland, Otago and Central. All games will be live scored on the www.blackcaps.co.nz and match wrap ups can be found on the Cricket Wellington website. "Trevor Rigby - an absolute sporting legend of the eastern suburbs and Wellington has passed away at the age of 83. Trevor was a stalwart of the old Kilbirnie Cricket Club - one of the forerunner clubs of the Easts Cricket Club. He was one of the guiding lights in the amalgamation of Kilbirnie and Midland St. Pats in 1993, and was the inaugural Co-President of the then newly formed Easts club. I’m sure all members will join me in extending deepest sympathy to his family." The New Zealand Chairmans XI to play Sri Lanka in a two-day match at Queenstown on Sunday and Monday, 21-22 December, has been named and Easts player Jamie Gibson has been selected. Congratulations Gibbo !!!!!!! Our website has been updated with the 2020 & 1 day matches for the Premier team and 1 day matches for the Premier Reserves. Have also provided links on these pages so that you can easily view ALL TEAMs, rounds and results on CricHQ. Other teams games will be uploaded once they appear on CricHQ. This year THE MIGHTY EASTS will field 25 teams - no other club in NZ can match this !!!!! Easts Jeetan Patel was a key figure in the winning of the Natwest T20 Blast competition in the UK. The Birmingham Bears are also coached by former Eastern Suburbs professional player Dougie Brown.